Heathcare organizations called on Gov. Scott Walker's administration and lawmakers to consider the impact that self-funding the health plan for state and local employees could have on Wisconsin's healthcare market. Fourteen groups, including the Wisconsin Chapter, ACEP, Wisconsin Counties Association, Wisconsin Hospital Association and the Wisconsin Medical Society, sent a memo to lawmakers Monday cautioning that the "potential repercussions" of self-insuring "could be far-reaching" and "significant" for the state's taxpayers and economy. The Department of Employee Trust Funds has issued a request for proposals to self-insure the health plan for state and local employees. In such an arrangement, the state would take on the risk for the roughly 250,000 state and local employees, as well as their families, currently covered under the program. The proposal could reduce the number of HMOs serving the program. It could also save the state up to $42 million, according to one report. A different report said the move could save $20 million or cost the state up to $100 million. Walker has said any savings would go to education. The 14 organizations called on the state's Group Insurance Board, members of the Joint Finance Committee and Walker to "fairly compare" the results of the RFP to the current system, evaluate "possible significant risks to state taxpayers" and assess whether self-funding protects the competitive strength of the state's health insurance market. "The State Group Health Program has been remarkably successful in using choice and competition to control costs, improve quality and maintain financial stability and value for taxpayers," they wrote. "Any alternative the state considers should be held to this high standard." Walker spokesman Tom Evenson wrote in an email that the governor appreciated the input and will take it in consideration. "In the end, we will move forward with a plan that is best for Wisconsin," he said. Join Wisconsin Health News on December 6th in Madison for a panel presentation on scope of practice, team-based care and the future healthcare workforce. The federal health reform law has ushered in a new wave of patients. Meanwhile, the state could face a shortfall of more than 4,000 doctors by 2035, and a 35 percent gap between the demand for nurses and the actual supply by 2040. So, who is going to take care of all these new patients? How will primary care be delivered in the future? In what areas does it make sense to expand the scope of practice? Where does it not? Doctors who prescribe controlled substances will have to complete training relating to the Medical Examining Board's opioid guidelines under a rule that went into effect earlier this month. November 3, Wisconsin Health News - A federal grant will help Ministry Health Care expand its telemedicine program to clinics across seven northcentral Wisconsin counties. The United States Department of Agriculture announced the $432,258 grant last week. It'll expand a project allowing advanced practice nurse practitioners to consult with physicians and provide care in facilities serving Clark, Forest, Lincoln, Marathon, Portage, Vilas and Waupaca counties. "These investments will help provide better healthcare and educational opportunities for rural residents," USDA Secretary Tom Vilsack said in a statement. Ministry, which is part of Ascension, plans to add therapeutic services to the program, including dietary and diabetic counseling, tele-psychiatry and post-hospitalization, post-surgical follow-up, according to the USDA. The project will connect 13 rural clinics and two hospitals to Ministry Saint Claire's Hospital in Weston, according to Ministry spokesman Tom Weaver. It will allow Ministry to care for more complex patients within their home communities and has the potential to provide more than 100,000 telemedicine visits during the next three years, Weaver said. Ministry's project was one of only seven healthcare projects and the only Wisconsin project funded in the grant cycle. Eighteen projects in 16 states received $4.7 million. November 2, Wisconsin Health News - The state collected 58,729 pounds of unwanted medications and prescription painkillers during a national prescription drug take back day on Oct. 22, the Department of Justice said Tuesday. November 1, WISHIN - WISHIN Connections is the monthly e-Newsletter from the Wisconsin Statewide Health Information Network (WISHIN). We will keep you up to date with WISHIN activities, news on health information exchange (HIE) and new product developments. In the October 2015 edition of WISHIN Connections, we outlined the benefits of regional and statewide health information exchanges (HIEs) like WISHIN in enabling collaboration among groups striving for healthcare interoperability. A year has passed and the content of that article is still relevant. But as HIE evolves, questions remain about how all of the options compare and contrast with each other. Interested in sharing your emergency medicine expertise? Wisconsin ACEP is now accepting abstracts from members and others interested in hosting a roundtable session at the WACEP 2017 Spring Symposium, Tuesday, March 28, 2017, at the Madison Concourse Hotel in Madison. The symposium will offer, "Hot Topics in Emergency Medicine" an afternoon session that will include a variety of roundtable discussions. Table hosts will facilitate five 15-minute discussions on their topic of expertise, as attendees rotate tables during the 75-minute session. Brief abstracts must be submitted via email to WACEP@badgerbay.co. Content described in the abstract must be appropriate for facilitating 15-minute discussions on the topic. Abstracts must include at least one learning objectives for your roundtable topic. The Symposium planning committee will review all abstracts to make a final determination of roundtable topics by December 1st. Pokémon Go: Emergency Medicine Friend or Foe? From October 26 to November 1, Pokémon Go is having a special Halloween event where players are heavily incentivized to get outside and catch Pokémon. Translation: there will be a lot of absent-minded kids (AND adults—40% of players are over age 25) wandering around the side of the road and maybe even your hospital for the next few days. We're having a little fun at WACEP this Halloween, so here's our take on Niantic's smash-hit smart phone game Pokémon Go and how it affects emergency medicine in Wisconsin. Pokémon Go was released on July 6, 2016, and on the eve of its five-month birthday, the app has already achieved legend status with 600 million downloads, 25 million active daily users, and more than $500 million in net revenue thus far. The app is essentially an augmented reality game that is played on a smart phone and encourages users to go out and hunt mythical "pocket monsters" (Pokémon) in the real world. 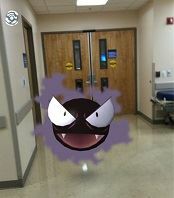 Augmented reality means that players see the Pokémon on their smart phone screen as though the monsters were floating in the real world (see photo of a "Ghastly" Pokémon floating around my emergency department). Players are rewarded for physical activity and also for visiting Poké-Gyms where they can have their Pokémon battle in order to advance in the game. Poke-Gyms tend to be located in parks, shopping centers and other community gathering places...including hospitals. There is a Poké-Gym outside of my ED and I frequently spot Pokémon players clustered around the site. So why does this matter? From an injury prevention stand-point, Pokémon Go is certainly problematic. The game seems to throw players into a trance-like state where their level of situational awareness is similar to that of intoxicated person. This would be fine if the players were sitting at home, but they are typically wandering the streets, biking, or (gulp) driving while trying to catch a rare Charmander or Dratini. News reports have highlighted multiple cases where pedestrians have walked into traffic and—in one case—off of a cliff. Even scarier, there was a report in New York of a mugger using Pokémon lures (an item in the game that is publicly view-able to all players and lures Pokémon to a certain spot) to bring victims into his vicinity. Luckily, that appears to have been an isolated incident. Having acknowledged the downside of the game, here's the case for why emergency physicians should be happy that Pokémon Go is out there. First of all, this game really does encourage physical activity and Americans across the country are getting off the couch and reducing their risk for chronic health conditions through good clean fun. In fact, Business Insider magazine reported in September that Pokémon Go players have walked a cumulative total of 4.6 Billion kilometers since the game's release. What is the Pokémon Go number needed to treat to prevent one myocardial infarction? Second, the game encourages real-life socialization (as opposed to online chatting) in that Pokémon Go players often meet in person to play and even host events to bond over the game. Within households, countless family-focused organizations and parenting blogs have celebrated how the game gives parents and their children an opportunity to spend quality time together. This is good for our communities in terms of building social support networks, strengthening family ties, and getting isolated individuals to engage in a productive way with their peers. Pokémon Go schizophrenia support groups? Third, the Pokémon platform has been repeatedly praised on college and high school campuses as a weekend social activity that doesn't center around alcohol consumption. One-less drunk teenager trying to keep the party going in your ED at three in the morning? So what do you think? Emergency providers are generally a fun-loving, active bunch...is Pokémon Go the monkey bars of 2016, or is it a welcome alternative to drinking on the couch? Share your comments and have fun this Halloween--with or without Pokémon Go. October 24, Wisconsin Health News - The Medical Examining Board has approved emergency rules that require doctors who prescribe narcotics to complete biennial training relating to the board's opioid guidelines. Under the rule approved last week, doctors who renew their licenses in 2017 or 2018 will have to complete an educational course or program relating to the guidelines for at least two of their 30 hours of required continuing medical education. Those who renew in 2019 or 2020 will also have to complete at least two hours. The rule doesn't apply to physicians who lack a U.S. Drug Enforcement Administration number to prescribe controlled substances. The rules could go into effect as early as next month, according to the board's newsletter. The board plans to hold a public hearing next month regarding telemedicine rules. October 20, Wisconsin Health News - Jennifer Malcore will serve as the next assistant deputy secretary at the Department of Health Services, according to a Wednesday statement. Bill Hanna, who's held the position since August 2015, has accepted a job outside of state government, according to DHS. Malcore is currently chief of staff for Rep. John Nygren, R-Marinette, and has worked on his Heroin, Opioid Prevention and Education Agenda. Hanna will leave DHS Oct. 26. Malcore starts Nov. 14.